University Of Iowa Press, 9781609385811, 144pp. Laura Esther Wolfson’s literary debut draws on years of immersion in the Russian and French languages; struggles to gain a basic understanding of Judaism, its history, and her place in it; and her search for a form to hold the stories that emerge from what she has lived, observed, overheard, and misremembered. In “Proust at Rush Hour,” when her lungs begin to collapse and fail, forcing her to give up an exciting and precarious existence as a globetrotting simultaneous interpreter, she seeks consolation by reading Proust in the original while commuting by subway to a desk job that requires no more than a minimal knowledge of French. 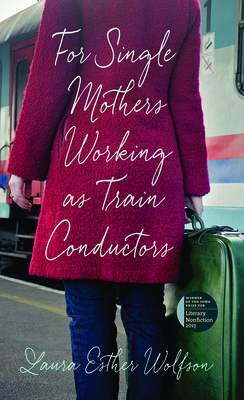 In “For Single Mothers Working as Train Conductors” she gives away her diaphragm and tubes of spermicidal jelly to a woman in the Soviet Union who, with two unwanted pregnancies behind her, needs them more than she does. “The Husband Method” has her translating a book on Russian obscenities and gulag slang during the dissolution of her marriage to the Russian-speaker who taught her much of what she knows about that language. In prose spangled with pathos and dusted with humor, Wolfson transports us to Paris, the Republic of Georgia, upstate New York, the Upper West Side, and the corridors of the United Nations, telling stories that skewer, transform, and inspire. Laura Esther Wolfson’s writings have appeared in the Bellingham Review, Columbia Journal, Gettysburg Review, Poetry Daily, rumpus.net, Superstition Review, Sun, Zyzzyva, and elsewhere. She lives in New York City.